Phillies pitchers and catchers are due to report to Bright House Field today for the official opening of 2015 spring training, and recent comments by ace Cole Hamels have driven numerous radio talk hosts, sports writers, and bloggers into a state of hysteria. To me, their reaction is completely overblown, and actually seems a bit hysterical. For weeks, various sources have characterized that this Phillies spring training was going to be "uncomfortable" and "awkward", and noted that the situations involving the continued presence of Hamels, Ryan Howard, and Jonathan Papelbon was going to create some major distractions. The fact is, the only distraction is going to be created by those very reporters and commentators, repeatedly talking to players and management regarding trade rumors and other situations regarding these players. The players themselves, Hamels included? They'll simply be training in preparation for the coming season. They are all professionals, and the players most in question are extremely wealthy professionals. Sure, they care about what team they might play for, what city they might live in, where their families will end up. But these are all grown men who know the score. They would be just fine, thank you, if left alone. But they won't be left alone. The media, thinking it's their job, will constantly rehash the same old questions: "What have you heard regarding any possible trades, Paps?" "How is your mental state, with all these rumors swirling, Cole?" "Do you expect to be with the club all season, Ryan?" "How's the arm, Cliff?" It won't matter that the players each hold some opening presser in which they answer all these questions and more. It won't matter if the players answer the questions a dozen times in the first few days. The media will just keep asking away. So the "distraction" is caused by whom? In the recent hysteria regarding Hamels, that media, particularly some bloggers and radio personalities, have jumped all over statements by the lefty that he would like to play for a winner, God forbid. In an interview published yesterday in USA Today: "I just want to win. That's all. That's all any competitor wants. And I know it's not going to happen here. This isn't what I expected. It's not what the Phillies expected, either. But it's reality." Anyone who has any problem with what Hamels stated a month ago needs to do some serious introspective thinking. Let's break down the exact quote to find the part that anyone should take any issue with. "I just want to win. That's all. That's all any competitor wants." Truth. If any writer or fan expects any professional athlete to not care about winning, then their opinion is invalid. Pro sports are all about two things: entertainment and winning. Period. Hamels is a competitor at the highest level, and that he wants to win should not only be no surprise, it should be what we expect of him. "And I know it's not going to happen here. This isn't what I expected. It's not what the Phillies expected, either. But it's reality." More truth. Both club President Pat Gillick and GM Ruben Amaro are officially on record as saying that the team is now rebuilding, and does not expect to contend over the next couple of seasons. 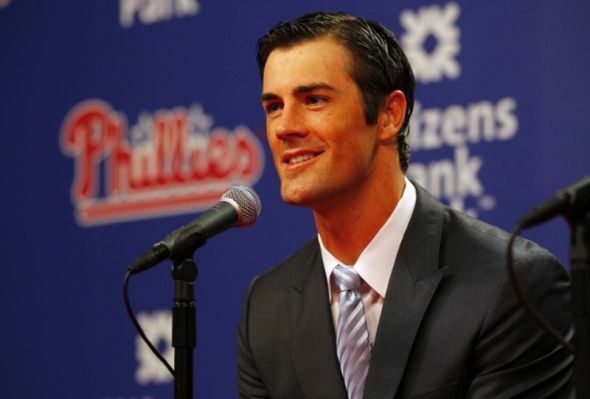 When signed to his lucrative longterm deal, Hamels was told by Amaro that the team would contend annually. Things fell completely apart, somewhat unexpectedly. Hamels may not have been lied to by Amaro, but he was misled, as it appears that it was implied to him that the team would continue to do whatever it would take to field a winner during his contract. That is not the case. Hamels went on to state: "In the grand scheme of things, we have a very small window in our lives. You understand this is going to end. The Phillies will go on forever, but we know our careers are going to end. And I want to go to a place where I can win again." He is absolutely correct in that comment. The Phillies can afford to take the time to rebuild as an organization. They have been around since 1883, and they are likely to be around in 2083. As we have seen already with Roy Halladay, and may be seeing with Cliff Lee, a player's career is finite, and can come to a halt in a flash. Why should Cole Hamels be expected by the fans or by anyone else who understands the nature of competition to wait around through his early-30's while the Phillies rebuild and make little or no effort to compete for a title? Also, one thing that Hamels has never done is walk into the front office, or make a statement through the press, and demand a trade himself. He didn't put his name out there all winter long. The team did that. Amaro has talked to other clubs about dealing his ace, and the parameters of those talks have often leaked out into the public. "Listen, all of these guys want to play for competitive and winning teams. Thats the nature of the beast. These guys are human beings, they want to win...My job is to create that atmosphere again and it may take a little time to get there. But I don’t have any problem with Cole...at all because I know he wants to compete...He’s a very professional guy, he’s going to go out and pitch, and he’s going to do his job here." No, there is absolutely nothing at all wrong with anything that Cole Hamels has said. If the media cared anything at all about something besides getting their headlines, they would understand that they now have the story. Hamels wants to win. The team has said it is rebuilding, and he won't win here, at least for a few years. There is no possible way for Cole Hamels to be a "distraction" here at spring training. In fact, the same goes for the other players previously mentioned here. No, the only distractions at spring training will come from the media, who will, as usual, look for sensationalism and speculation before substance. Play ball!